Last month was not a very good month for me. Within 2 weeks, 3 of my necklaces and 1 crucifix pendant went missing. 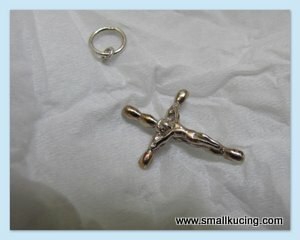 it would have been 2 Crucifix Pendant missing. But Mamarazzi found this when she was sweeping the floor. Speaking of Crucifix, poor Jesus was crucifix by the bad people on a big cross. Maybe that is why Crucifix is a symbols to all Christian now. As told in Enid Blyton's book "The Children's Life of Christ", Jesus was forced to carry a big and heavy cross to the execution grounds. People were jeering at him as on his neck hung a placard that says "King of the Jews"
There was one time where he could no longer carry, Simon of Cyrene were asked to carry it for him. Jesus was nailed to the cross with two robbers next to him. At the beginning even the robbers jeer at him. People were saying since he is the Son of God why he can't rescue himself. Then one of the robber looked at Jesus face and saw his calm and patience even though he was dying. The robber felt ashamed. And when the other robber taunt Jesus, this robber chided him. He said that they had one wrong and deserved to be punish but Jesus is innocent. Then he asked Jesus to remember him when Jesus is in his Kingdom to which Jesus replied that he will be with Jesus in Paradise that day. Some of Jesus's friend were there too though they are helpless. They can only grieve as they know he is dying. John who is Jesus favourite disciple were there too with Mary, Jesus mother. Jesus saw their sadness and said to the "behold your son" to Mary and "Behold your Mother" to John, to which they understood that they are to be like mother and son from tat day onwards. A man saw Jesus was thirsty and he ran to dip a sponge into a bowl of sour wine nearby, poke the sponge on the end of a stick and gave to Jesus to wet his mouth. Then it was finished. After the end, a man who was a secret follower of Jesus went to Pilate ask for Jesus body for burial. Together with Joseph and a few others, they brought Jesus body to a nearby caves that is cool and wrapped the body with sweet smelling linen. They left the body in the tomb and rolled a big stone to lock the entrance to the cave. Some women whose where there said they will come again to bring sweet spices to anoint him. But then all is not lost... Jesus will come again! I love reading your Saturday christain posts. I'm glad you where able to find your pendant. I have lost many of mine. Never know how to keep still, that's why! Spank! Spank! Though I am not a Christian, I have the holy rosary, in fact a couple hanged on the corners of my bed and a bible at home, these protects me while I am asleep in the night.